The Fluke C25 is a Large vinyl soft case with water resistant zipper and one inside pocket for test leads or small accessories. Convenient 3" (76 mm) belt loop accommodates tool belts. 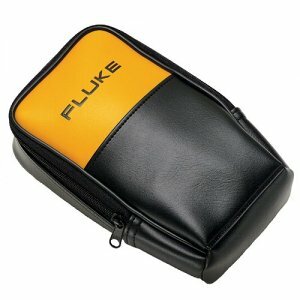 For Fluke 20, 50 or 70 Series meters in C70 Holster; or 80 Series meters in C81 Holster. Also for use with PV350. Size: 8.3" H x 4.9" L x 2.75" D (18.4 mm H x 124.5 mm L x 69.8 mm D).